Six biological pigments called rhodopsins play well-established roles in light-sensing in the fruit fly eye. Three of them also have light-independent roles in temperature sensation. New research shows that a seventh rhodopsin, Rh7, is expressed in the brain of fruit flies where it regulates the fly's day-night activity cycles. The study appears in Nature and was funded by the National Eye Institute, part of the National Institutes of Health. "Rh7 is the first example of a rhodopsin that is important in setting circadian rhythms by being expressed in the central brain, rather than the eye," said Craig Montell, Ph.D., Duggan Professor of Molecular, Cellular and Developmental Biology at the University of California Santa Barbara and senior author of the study. This newly discovered role for Rh7 could have clinical implications down the road. "Identifying new roles for light-sensitive opsins is essential for understanding degenerative retinal disorders and developing potential new treatments," said Lisa Neuhold, Ph.D., program director at the National Eye Institute. Rhodopsins, discovered in the 1870s, are well-known for their important role in light-sensing and image formation. The six previously known fly rhodopsins account for the full function of photoreceptor cells in the fly's eyes, so although the fruit fly genome contained the sequence of a seventh rhodopsin, the role of Rh7 was unclear. To investigate the role of Rh7, Montell and collaborators at the University of California, Irvine, first confirmed that Rh7 sensed light by doing genetic experiments that replaced Rh1, the primary light-sensor in photoreceptor cells of the fly eye, with Rh7. The researchers found that Rh7 could functionally substitute for Rh1 in flies missing Rh1, as measured by electroretinogram, which is an extracellular recording of a neural signal in the fly eye in response to light. Next, the researchers used antibodies recognizing Rh7 to determine its expression pattern. They found that it was expressed in the brain's central pacemaker neurons, which play a role in regulating circadian rhythms. Montell and his team reared fruit flies under a 12-hour light/12-hour dark cycle, then extended one light cycle to 20 hours and measured how quickly the flies adjusted their daily activity to match the new light/dark cycle. 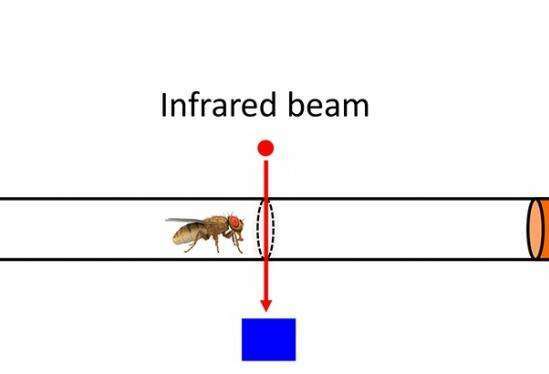 By measuring how often the flies crossed an infrared beam positioned in the center of the vial, the researchers could track daily patterns of activity. They showed that the flies missing Rh7 took significantly longer to adjust than the normal, wild type flies. The researchers also examined the effect of light pulses in the middle of the night, which disrupt the normal circadian cycle, and again found that the readjustment took longer in flies missing Rh7. The central pacemaker neurons were already known to have a light sensor called cryptochrome, but the ability of flies who were genetically engineered to lack cryptochrome to regulate light/dark cycles is only partially impaired. So, the researchers suspected that another molecule might be involved—and that turns out to be Rh7, which is more light-sensitive than cryptochrome. "It appears Rh7 provides a more sensitive way of detecting light and setting circadian rhythms," explained Montell. However, more research is still needed. A light sensor in the brain makes sense in the fruit fly, because light can pass through the cuticle covering the head. But what could opsins be doing in the mammalian brain, where light may not effectively penetrate the skull? 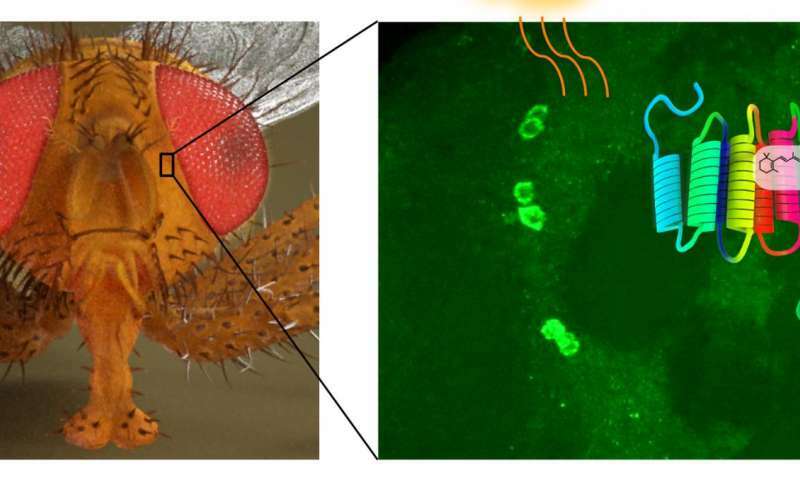 Montell suggested that the fly's central pacemaker neurons may correspond to a type of cell in the mammalian eye, rather than cells in the mammalian brain. In the eye, retinal ganglion cells (RGCs) relay signals from light-sensing rods and cones and to the brain via the optic nerve. But about 1 percent of RGCs are intrinsically photosensitive (ipRGCs). These ipRGCs, which contain melanopsin (another type of light-sensitive pigment), do not have roles in image formation but are important for the regulation of circadian rhythms. Due to their similar function and similar molecular features, Montell believes that the fly's central pacemaker neurons expressing Rh7 are the equivalent of mammalian ipRGCs. However, a mystery remains as to why opsins are also expressed in the mammalian brain and spinal cord, where they may not receive sufficient light to be light activated.